selected by Google to test out their new device. TAMPA, Fla. -- Yes, that guy over there is talking to his glasses -- or rather to his Google Glass -- the tiny square floating out in front of his glasses. Joseph Evans, a Ph.D. graduate research assistant in the Department of Anthropology, working in the Alliance for Integrated Spatial Technologies (AIST) is showing us that it’s time to hit the reset button -- once again -- on everything we know about personal computing, communicating and social media. The next revolution is here and spreading because it is now possible to wear your computer -- on your face. 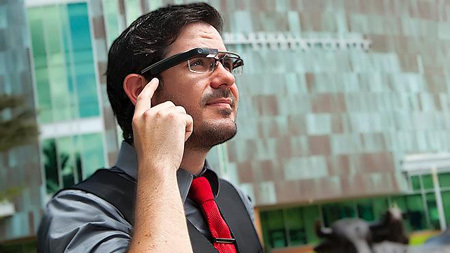 USF is the first Tier 1 University within Florida to be part of the Google Glass vanguard of explorers, thanks to Evans. When he saw the announcement on Google+ about the international search for “bold, creative individuals” to help test the device, Evans thought, “Why not apply?” His 50-words-or-less tweet to #ifihadglass was submitted in February, and he received the good news in March. He was to be what Google has dubbed a Glass Explorer. Evans is perfectly suited to be one. Exploring is his life. As an archeologist specializing in cultural/heritage documentation and management, his travels have taken him to Cape Canaveral recently and many sites throughout the Southeastern U.S. -- with many more to follow. Evans scraped together the funds to purchase Glass, but getting to New York in July to pick up the device and stay for the orientation and training was about equally expensive and a concern. USF came to the rescue. “Nico Karagosian (senior director of development), and the folks with the CAS Foundation, and my directors at AIST, Drs. Lori Collins and Travis Doering, upon hearing that I was chosen for this program, generously reached out to pay for travel and board,” Evans said. In the “one device, many explorers” project, Evans is one of the lucky 2,000+ who were given the coveted opportunity to be among the first to use Google Glass. Another 6,000 are waiting in the wings to be chosen until 8,000 are gradually distributed. And he’s thrilled about it. Evans’ first use of Google Glass was to give Research Assistant Professor Lori Collins, co-director of the AIST, a call and show her his view from the top floor of Google’s offices in midtown Manhattan. Blown away barely covers her reaction. Archeology is just one use. “As much as I like looking at the past, I like keeping people alive today,” Evans said. Evans said he called on his fellow graduate student Alex Montiel-Ishino to partner with him on the application. Montiel-Ishino, who just earned his master’s degree, with a double major in anthropology and public health, wants to see Glass used to research new ways to deliver medical services -- though it won’t be the first time. Collins is already on board. There’s interest around campus already: USF Athletics, medical doctors at Tampa General Hospital, as well as anthropologists in Evans’ department. And Evans is keeping busy off campus. Before giving Montiel-Ishino an extended turn to live with Glass in Philadelphia, where he is working toward his Ph.D. at the University of Pennsylvania, Evans is making this powerful tool an integral part of his daily life. Messages are in the upper right quadrant of the right lens -- to be exact -- about 30- 40 degrees above the horizon -- unobtrusive and transparent. And as noted, he talks to Glass. First Evans says, “Ok Glass,” then issues voice commands, such as, “Glass check email,” and Glass can read his email to him or display it. He can also dictate notes. A menu of options -- including taking photos and recording 720p HD video -- is literally at his fingertips. He slides a finger in four directions along the side, which is a touchpad. But for Evans, “About 80 percent is voice commands, the rest is touch,” he said. Because Glass is so thin and light -- whether one wears glasses or not -- it is largely unobtrusive -- a feature Evans values. A recent commentary on the radio program “Fresh Air” related how one Glass Explorer found himself being avoided at a party by a woman afraid of being recorded without her permission. Some are rushing to other judgments about the device. The UK is already poised to ban the use of Google Glass while driving, likening it to the cause of distracted driving by cell phone users. But Evans describes what he sees as “non-distracting” -- no more than what happens when glancing at a road sign for a split second while maintaining attention on the road ahead. At least diverse points of view are in the mix at this early stage. Evans observes that the distribution of Glass is very democratic. In addition to programmers, “Explorers come from all walks of life: developers, moms, doctors, social media mavens, filmmakers, average workers, etc. They have the potential to invent uses Google may have never considered. Collaboration is leading to new applications and advances that are happening with tremendous speed. Though there is only a handful of Explorers in the Tampa Bay area, they and the rest of their community get to talk amongst themselves at a special online site. Evans says Glass applications are being developed to help the blind navigate environments and automate homes and functions for people unable to do things on their own, to name a few. “The sky’s the limit,” he repeats often. Evans is thinking proactively about Glass’ future. While we may not be able to walk in another person’s shoes, with Google Glass it is possible to see the world through other people’s eyes. Visit http://www.google.com/glass/start/how-it-feels/ to see some examples of what Google Explorers are seeing. And if you have an interesting academic or research use for Glass and would like to consult with him about it, contact Evans at josephevans1@mail.usf.edu.